Technically my vacation started a few days ago (I’ve already been in Kentucky for a while catching up with family), but I wanted to let folks know that I’ll be posting less for a few weeks. Last year I didn’t blog at all for a month; this time I intend to blog 2-3 times if something sounds like fun to discuss. It’s a very solid 5-6 page introduction to SEO. I believe the magazine is sold in the U.S. as Practical Web Design. – You might have missed this one, but I did an SEO interview with Zac, a Chinese SEO/search blogger. The most fun part of this was that I did this interview jointly with Jianfei Zhu, a member of my team and a top engineer on Chinese webspam. By the way, Jianfei will be speaking at SES China later in May. What’s a You&A? That’s where you, the audience, put your questions directly to the head of Google’s web spam team, Matt Cutts. As an engineer in search quality, Matt’s been dealing with webmaster issues for Google since 2000 and is well known to many advanced search marketers from his blog and public speaking. I may be a little out-of-touch after not reading feeds for a few weeks, but I’ll try to answer the questions as best I can. I think the conference will be fun (I’ve never been to Seattle! Bad Matt! ), but if you can’t make it, I’m sure it’ll get live-blogged. Update: One more Matt fix if you care. I’m getting on a plane, so I haven’t read the article yet. I mean, enjoy your vacation Matt. Hopefully you won’t get taken again. Blog less, enjoy vacation more. You’ll feel reinvigorated once you return. Have a good vacation Matt. That’s the nice thing about technology. You can take some time off and then read all your feeds to get back into the game. Anything you missed will be old and tired anyway so if you miss a month it won’t affect much. Anyway. Enjoy the time off. Hopefully you are enjoying your vacation. – You usualy confirm (or mention) TBPR updates. Not this time. Any reasons? – Adam mentioned lately that at present there might be errors in the figures of TBPR. Has that been fixed? – Summer seasons usually good times for GOOG to conduct major updates and developements. Any thing you wish to share with us in that connection? Yeh saw that issue of .net some of the editing of the articles a bit sloppy thers some stuff implied in vanessas bit about the links report in webmaster tools – that i’me prity sure isnt what she inttended.to say. ie that the links in webmaster tools is a definative list of links that google knows about. Looks a good issue I primarly got it for my new assistant as shes starting out leaning about search engines. ps we had a muntjak deer in our garden the other day quite how it got over the 10 foot walls we are unsure. Matt, I hope you are having a great vacation! Enjoy the bejeebus out of it! Notice on the pic of Matt the line that follows his head round, but then the shoulder goes off to outline, what I believe, can only be a giant mega-cyborg evil-matt cutts borg anti-spam suit! With huge spikes on the shoulder pads to boot! Who else thinks this was photoshopped out? Hi matt, keep your time, you need holiday. How are you going to resist graywolf’s feed taunts Matt? What are you going to do when Threadwatch claims that you are throwing babies out of the train? Have you got hidden powers? I’m a subscriber to .net magazine, and this issue is especially good. 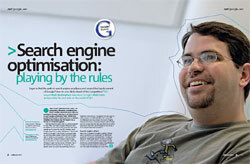 It’s not just one feature article – there are several articles dedicated to Google. Thanks for taking part Matt! I’m sure it’ll help a lot of people out there, who are looking for the right solution to SEO. isn’t it wonderful, matt? i love having a horsefarm three doors down from my house. yes, KY really is a nice place to live. Yeah i picked up a copy of .net in my local borders and nearly dropped my phone when i opened it…. – Yup, there was a toolbar pagerank update a week or two ago. – I think Adam said that he was willing to investigate reports of problems. I’ve passed on 1-2 sites to the toolbar folks to check into, but for the most part it was a relatively normal toolbar pagerank update. – I haven’t given up hope that I’ll still add to my “how to report paid links” post with some examples of the sorts of reports that are helpful, but let’s keep that conversation over on that post. – Yes, summer definitely continues to be a good time to work on core relevancy changes. Quality folks always try to make changes be non-disruptive, but summertime is when traffic is sometimes lower, so it’s a great time to do different changes. That said, I don’t have special knowledge of any huge upcoming shifts; it’s just a good time to make changes. Maurice, the list of links in the webmaster console is already quite good, and it will just grow more definitive over time. Thanks for the heads-up about the vacation, Matt. Hope you have a great time and hope we hear from you soon! I have never read .net before but it looks like I might have to start. Thanks. You all are going to get Matt in trouble for not vacationing properly and spending time on the computer. When will webmaster tools catch up, then, with this new data? Everybody needs to take some time off from time to time. I spend very much time with my projects, but family is always the first on my list, and I’m glad to see you have the same priorities :D.
So, did you give the Queen any advice on her Web site? Still, it comes top in the first G search I did, and I guess it *should* be able to manage some unique content. But does it get TrustRank? Can the site sell a link or does it only grant freehold? Well I guess Ill only check here three times this month. Matt, what’s with the “YOU MUST”, “YOU CAN”, “YOU CAN’T” AdSense login update hell? When I log in, it says I must update, and YOU CAN use your Gmail account, and then YOU CAN’T use your Gmail account, then loops infinitely. My Gmail and Analytics and AdWords are all the same login. Why not AdSense as well? SEO Interview with Zac was cool..
Hope you’ll will come India.!! I am glad that when I there is some useful information for SEO in china. Great article, I received my copy of .NET today – now I have something for you to sign when I eventually get to meet you, ha ha. As you can guess my autograph book is a little thin. SEO is not far-ranging in china as I konw. Its not suitable to ask any qestions now. Enjoy the time off, Matt. I had the best vacation ever last year when I was totally “unplugged” for four days straight – who knows when that chance will ever come up again? I just went to google.com homepage and at the top right in my browser next to login you have “iGoogle” for customizing my google homepage. Did you guys name it “iGoogle” to start even more news and lawsuits using leverage from Apple? I.E. iPod, iTunes and so on? Please explain that one to me? Seems really wrong to me…? Forgot to ask you about the new “graybar” and let you know the new Dean Koontz best seller book called, The Husband is a great fiction read for sure. Will check out the articles, looks like I’ll have some reading material. Have a very good vacation Matt …. with your family. Here in India it is very hot in summer. I also planned to take a leave but due to several of free lance project i cant take long leave. I would like to go to some hilly areas but it will cause my site to suffer from ranking. I did http://www.promotional-pens.us and now its on top for two keywords but still need to work for other two. My client is satisfied but he is waiting for ranking on other two keywords. My social life is zero. Vacation? What do you mean vacation Matt? Why do you think you need a vacation? Don’t play coy, I saw the Oprah video on YouTube and know everyone at G spends their days playing computer games or vollyball, getting massages, watching TV and getting haircuts! I see that to buy this issue of the NET mag online is now not possible as its sold out. This my frist time to see you blog but it good feeling ^^ i will back to see you blog. Matt’s gonna have 3000 messages in his inbox. Anyone else want to bet? Your hope disapointed when you saw….the first sign? Surely you didn’t expect Japan to remain as feudal and undeveloped in present day? Take a vacation in Morris County New Jersey if you want to see some deer getting the flowers, They have eaten my pine trees from the ground 8 feet up. They can be very aggressive as well. The other day my Jack Russel was outside and the deer came in, and of course the Jack went after them becouse this is his yard, all of the deer ran, but then one turned around and went after the dog, chased him around for a bit before running off. I have even heard reports of dogs who chase the deer being kicked to death. ← Good summer vacation books?